Romaine lettuce has been voluntarily pulled from shelves of Nova Scotia’s largest grocers after outbreaks of E. coli have been confirmed in other provinces. On Tuesday, the Public Health Agency of Canada issued a statement linking outbreaks of E. coli to romaine lettuce in Ontario, Quebec and some U.S. states. 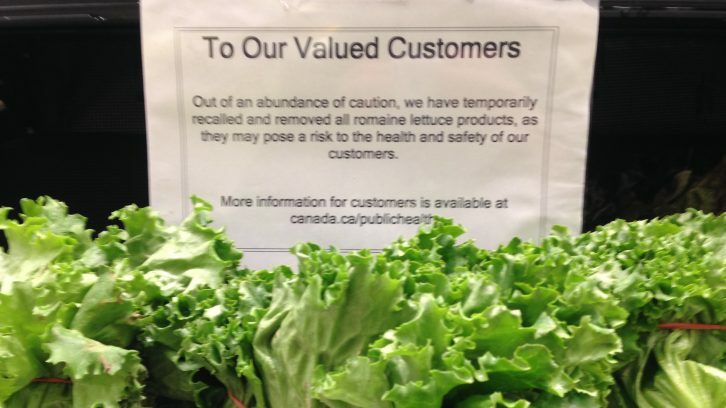 Initially, PHAC advised only residents in Ontario and Quebec to avoid eating romaine. That warning now also extends to New Brunswick, after an E. coli infection was linked to the lettuce on Wednesday. The cause or source of the contamination is still unknown. By Thursday, Loblaws, Sobeys, Walmart and Costco had all confirmed that, as a precautionary measure, their stores nationwide wouldn’t be selling romaine lettuce until more is known. This also includes products that contain the lettuce like pre-made salads and bags of mixed greens. “We have over 300 products in the broad network that need to come off the shelves,” said Cynthia Thompson, spokesperson for Sobeys. So far, there have been 19 confirmed cases of E. coli infections in Canada: three in Ontario, 15 in Quebec and one in New Brunswick. Out of the eight people hospitalized, one has developed a serious condition. In the U.S., 32 people have been infected by the bacteria. The Centers for Disease Control and Prevention has issued a warning to all U.S. consumers, telling them to avoid the vegetable. The PHAC said the strain of E. coli infecting people is the same strain that caused an outbreak last December. Most of the infected fell ill between mid-October and early November. Since new cases are still being reported, there is reason to believe the outbreak is ongoing, according to the PHAC. It’s possible contaminated produce could still be in grocery stores and restaurants. The PHAC recommends people in the affected provinces avoid romaine lettuce entirely. There is no warning or recommendation for Nova Scotia. Jimmy Zelios, owner of the Blue Olive Greek Taverna in Halifax, said he isn’t able to get romaine lettuce from any of his suppliers, but even if he could, he wouldn’t risk it. As soon as he heard about the outbreak, he threw all 75 or so heads of lettuce in his restaurant in the trash. Zelios said the lack of romaine lettuce isn’t much of an issue for him. He uses it to make Greek salad, so if a customer orders that, he’ll offer either iceberg or no lettuce. Steve Arsenault, manager of the Canteen in Dartmouth, hasn’t had many issues either. He said the only menu item affected was the caesar salad and the romaine was swapped for kale fairly easily. The PHAC said there is no real treatment for an E. coli infection. Symptoms include nausea, vomiting, headaches and diarrhea, which can last up to 10 days. While most people recover from the infection on their own, it is possible to develop a more serious illness and require hospitalization. In some cases, the bacteria can cause serious, life-threatening symptoms such as kidney failure or stroke.